Our schedule has been all wonky with a week lost to snow days and two days of delayed start times so we are all just trying to CRAM in as much as we can when we are in class!! I really enjoy this book and all that can be learned about animals in winter, sharing, habitats, etc. I wanted to stretch this theme into math by introducing counting by two's using this story. I started by collecting as many inexpensive mittens as I could get my hands on the past few weeks. Target's Dollar Spot was a good choice but Walmart also had two pairs for $1-an even better deal! We started by giving everyone a mitten (1/2 of a pair). They needed to notice how the mittens were alike and how they were different but how they were all used for the same purpose. Of course, it came up that some were for girls and some were for boys! Next, everyone had to find their "match". I know this is cheesetastic, I was trying to get the mister to smile since he had to match up to my mitten. He WASN'T buying it! Next, every pair got a clothespin with a number on it (2, 4, 6, 8, etc.). We then clipped them to the clothesline hung over our math board. Then we practiced and practiced counting by two's. During math rotations, the extra mittens were placed at a group for the children to pair up and figure out which numbers would come next after 20. Mrs. Lawson and her daughter came in that afternoon and she read The Mitten to our class. She bought the book as a gift for them! Thank you, Mrs. Lawson! A math job that I got from Deanna Jump-I believe! It also could have been from Growing Kinders! I have downloaded SO much from these two ladies that I am having trouble remembering where I got these great activities! A mitten follow up activity counting by two's. We are continuing to work on our Winter Books. 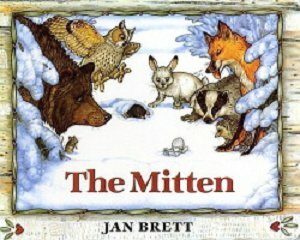 We will add a page for The Mitten next week. I got the idea for looking out of your window to see a snowman's profile from Musings of Me. We will add black strips of construction paper to make our window. They are loving this poem! We will add it to our Poetry Journals on Friday. At my table, we wrote what we did on one of our snowy days the week before last. I provided the sentence starter,"On my snowy day, I..." they had to finish the sentence themselves. 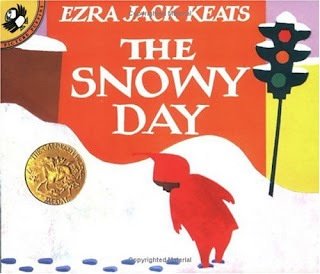 At another rotation, the children made themselves as they would look if they had a snowy day with Peter. This is another page in our Winter Book. I love all of their different versions of the same thing!! I have the snowflakes all ready for our Snowflake Experiment on Friday!